The 1961 Ferrari 250 GT SWB California Spider. Estimated value US$15-$17-million. Image copyright and courtesy of Gooding & Company. Photo by Mathieu Heurtault. 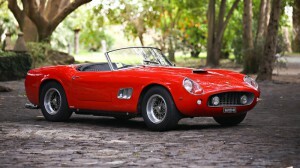 Gooding & Company, the auction house acclaimed for selling significant and valuable collector cars, will have a 1961 Ferrari 250 GT SWB California Spider (estimate US$15,000,000-US$17,000,000) available for sale at the Amelia Island Auction in Florida on March 11, 2016. This highly coveted Ferrari is the 22nd SWB California Spider built and one of only 37 covered-headlight examples produced. Remarkably, it has been in the loving care of the current owner for more than 30 years. Ferrari introduced the 250 GT California Spider in 1957 on their long-wheelbase (LWB) chassis for the booming North American market. Ferrari’s leading US dealers, Luigi Chinetti and John von Neumann, requested from the factory a dual-purpose sports car that was highly capable on the racetrack, but comfortable for use as a daily driver. In 1960, with the introduction of Ferrari’s new short-wheelbase (SWB) 250 GT Berlinetta chassis, Ferrari thoroughly redesigned the California Spider. The new 250 GT SWB California Spider benefitted from a much more sophisticated chassis, along with standard four-wheel Dunlop disc brakes, a refined suspension setup and new outside-plug engines. The renowned Italian coachbuilder, Scaglietti, redesigned the California Spider’s coachwork around the updated chassis, resulting in a much more aggressive and sporting appearance. Despite being a more refined and well-rounded sports car, the SWB California Spiders were true thoroughbreds, with several examples raced at events such as the 24 Hours of Le Mans and the Targa Florio. Between 1960 and 1963, Ferrari built just 56 examples of the SWB variant, with only 37 being highly sought after covered-headlight versions. The Ferrari 250 GT SWB California Spider that will be on sale, chassis 2871 GT, is among the most desirable SWB California Spiders. This Ferrari was purchased new in Milan, Italy by the famed Italian industrial designer, Gianfranco Frattini in September, 1961. While in Mr. Frattini’s care, chassis 2871 GT was featured in the Italian film Ieri, Oggi, Domani (Yesterday, Today, Tomorrow), which starred Sophia Loren and Marcello Mastroianni. Frattini lovingly owned the car for 17 years before selling it to Terzo Dalia in June, 1978. Dalia participated in two Ferrari events in the early-1980s before selling 2871 GT to the current owner in December, 1985. This important Ferrari has been with its current owner for the last 30 years, is well-documented by Ferrari historian, Marcel Massini and is presented in the classic colour combination of red with a black interior.